I have a confession to make—I am addicted to Diet Coke. My addiction started three years ago, and I haven’t been able to shake the habit since. It’s gotten so bad that if I do not have one by noon, I will get a headache. So, everyday I go and get a fountain Diet Coke to get my fix. 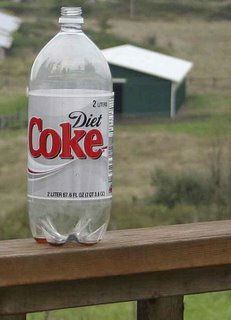 Although I enjoy my Diet Coke, one thing I have noticed when I get to the end of the drink is this—I’m still thirsty! Though pleasurable at the moment, the Diet Coke does not quench my thirst. So why is it whenever I know water will quench my thirst I turn to Diet Coke instead? I think the spiritual life for the Christian can be similar. We know nothing is able to quench our thirst like Christ, yet repeatedly we run in search of something else to fulfill our needs. We must honestly examine what fountain we are drinking from. What are you looking to or waiting on to quench your thirst? Isn’t that they way you feel sometimes too? Are you like me and tired of having to keep drawing from a fountain which leaves you parched? Christ offers Himself as the Living Water, a Fountain which never runs dry. Other people or things may offer momentary relief, but it will never satisfy that which we truly thirst for, which is only found when we come to the Fountain. My prayer for you and for me is that we would drink deeply from Christ with the promise He gives us to never be thirsty again. But in the meantime, does this mean I have to give up Diet Coke?